This work by France Zupan comes from his phase of colouristic painting when he maintained a close friendship with Mihailo Petrov and his wife Jelena. That was the time when he exhibited in Belgrade in the Art Pavilion Cvijeta Zuzorić. 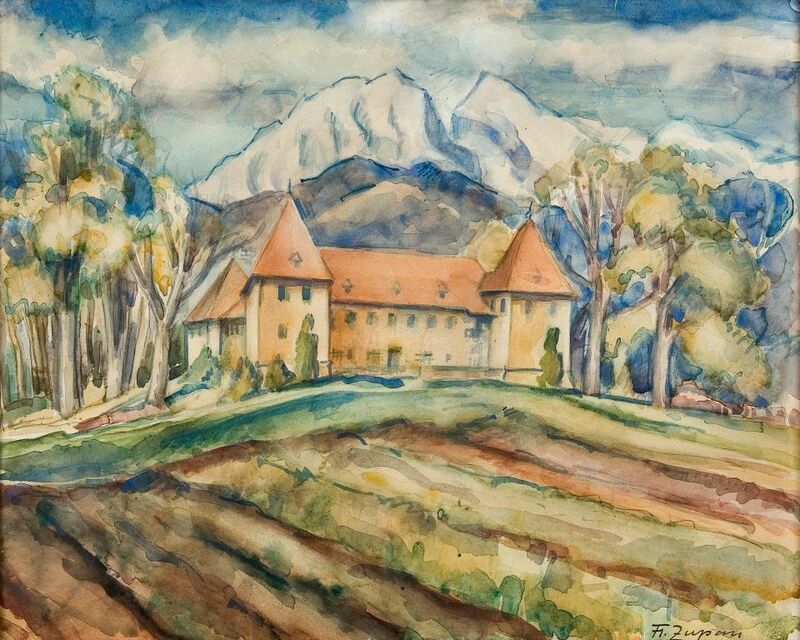 The stylistic features of Brdo near Kranj refer the work to the Cézannean painting of objective reality which Zupan got acquainted with in Paris in the thirties. This landscape painting shows in the foreground the Renaissance castle of Slovene noblemen which has been used for different purposes. In the twentieth century this particular part of the country and the edifice itself were mostly related to the political elite of Yugoslavia. He was born in Ljubljana. In 1909 he finished high school and the following three years attended the school of Rihard Jakopič. He spent all his life in Ljubljana where he had his studio. He worked several years as an art teacher. Zupan was particularly known as a landscape painter. His works were a mixture of impressionism and the secessionist tradition. In 1922 he joined the Club of the Young, but never adopted their expressionistic principles. He abandoned colouristic painting and endowed his objects with a cubist hardness (Goat Bridge in Sarajevo, 1925). Several years later, under the influence of fauvism, he returned to bright colours. He tried to achieve a balance between lines and colours, but his art rested primarily on his personal interpretations of the seen, adapted to contemporary tendencies. His art fully matured during the decade after 1934 (Seaside House, 1942) but his best works appeared during the 1950s (Pakleni otoci, 1952).